In The Black Knight’s Tune: Ruby’s Story, Ruby has the good fortune to be adopted by kindly white folks in New York, but as she grows up and becomes a journalist, her longing to know about her true heritage becomes overwhelming. When her white boss, with whom she has fallen in love, has her accompany him on a visit to the deep South, where the lady he loves is involved in the abolitionist movement, Ruby gets to participate in the lives of her black brethren living on the plantation. Though their lives differ from hers in New York, more than ever she feels their shared connection to the past and their resiliency. She is enriched by that experience and a couple of others that mean the world to Ruby and which I’ll leave for the reader to enjoy with her. It never ceases to amaze me how some authors, like Naomi Finley, can write a sensitive, realistic story in only a few pages while others will take twice as many pages to tell a similar story and not touch your heart. What a talent! The Black Knight’s Tune: Ruby’s Story is one of a series planned by Finley who tells us in her bio that she has “an affinity for the Deep South and its history” and is “fascinated by the resiliency of the human spirit.” That resiliency is evident in the female protagonist, Ruby, born to black slave parents but separated from them while still a youngster. Beautifully written, tightly edited, and with plenty of revealing dialogue and reflection, The Black Knight’s Tune will resonate in your memory long after you set the book aside. Like that famous song, “Amazing Grace”, Naomi Finley as crafted this novella with amazing grace. I look forward to her next book in this series. The Black Knight’s Tune is a work of African American historical fiction penned by author Naomi Finley. Written as a companion novella to A Slave of the Shadows Book One, this tale gives us the story of Ruby Stewart as she lives her life pretending to be a free black woman in 1853. Only Ruby knows the truth that she was once a slave, and this tension underlies everything she does as she works in New York for the Manhattan Observer. Here, she discovers her boss Kipling Reed might be more than just a friend, but when the Lady of Livingston, Willow Hendricks, shows up, Ruby’s past and romantic present are all thrown into new turmoil. Having encountered this series before, I was delighted to see an episode told from the perspective of Ruby in her new life in the Northern states. Despite having her newfound freedom, Ruby’s life is far from easy, and this is conveyed with great emotion and sensitivity by author Naomi Finley. The research into life in 1853 is meticulous and immersive, and I particularly enjoyed the world of journalism and cross cultural affairs of the progressive New York of the era. Kipling makes for a really interesting love interest for Ruby, causing her to question many things about the world she lives in and its potential for change in the future. Overall, The Black Knight’s Tune is an excellent addition to a great series, offering yet more emotional intrigue and insight into the freedom movements of the era. Ruby worked at The Manhattan Observer, a penny newspaper with a strong focus on its motto: Freedom for All. Her boss, Kipling Reed, targeted the middle and working class, and he had hired Ruby for a wage equivalent to that of a man. Ruby had some feelings for her boss and always thought of being in love with him, though he kept making fun of her with Saul, the editor in chief. She often wondered how it would be for a woman of color to be married to a white man. Ruby always dreamed of The Black Knight and the recurring dream plagued her ever since she met Willow Hendricks. Her past haunted her and there was an element of curiosity to discover where she came from. Was she the slave girl Mag whom her friend Willow had mentioned in the letter as being placed on the vessel Olivia I in Charleston in '32, heading to New York? 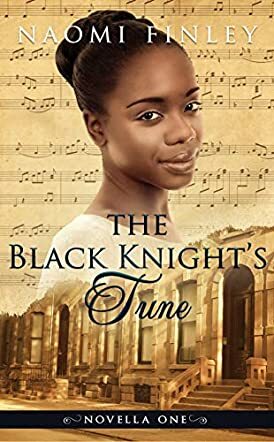 The Black Knight's Tune: Ruby's Story: Novella One by Naomi Finley is set against the backdrop of the slave trade that existed in the 1850s. It is a story of family reunion and I liked the way in which the author knitted Mag's and Ruby's lives seamlessly together, and the story is also a fine blend of self-discovery and romance. All the characters, be it Ruby, Saul, Kipling, Willow, Ruby's parents, and the others, have been portrayed well, and readers will find them realistic. There are some heartwarming moments in the story when Ruby reunites with her family. The author's writing style is neat, simple, and elegant. She captures the emotions and resilience of the human mind through the main character of Ruby. I am eagerly waiting to read Novella Two to learn more about Ruby and Saul's story together.